Properties missing from Visual Studio 2010 Intellisense..
Today I ran into a problem that made me think I was either blind, crazy.. or both. 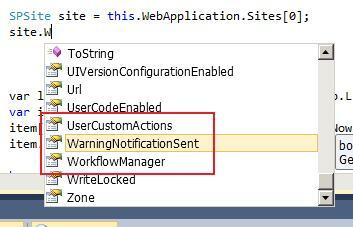 It turned out this property is not visible in Intellisense because my SharePoint project is a “sandboxed” solution (and I think this is the default setting). Sandboxed solution is new to SP 2010: http://msdn.microsoft.com/en-us/library/ee539083.aspx. Set the project to be a “normal” solution and the property I was looking for is visible in Intellisense. You can do this by clicking on the project file in the Solution Explorer, and set it in the Property window. This entry was posted in SharePoint, Visual Studio 2010. Bookmark the permalink.